Linus Benedict Torvalds (Swedish pronunciation: [ˈliːn.ɵs ˈtuːr.valds]; born December 28, 1969 in Helsinki, Finland) is a Finnish software engineer and hacker, best known for having initiated the development of the open source Linux kernel. He later became the chief architect of the Linux kernel, and now acts as the project's coordinator. He also created the revision control system Git as well as the Scuba diving log book software Subsurface. Torvalds was born in Helsinki, Finland. He is the son of journalists Anna and Nils Torvalds, and the grandson of poet Ole Torvalds. Both of his parents were campus radicals at the University of Helsinki in the 1960s. His family belongs to the Swedish-speaking minority (5.5%) of Finland's population. 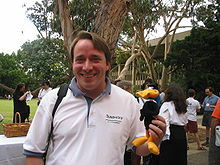 Torvalds was named after Linus Pauling, the American Nobel Prize-winning chemist, although in the book Rebel Code: Linux and the Open Source Revolution, Torvalds is quoted as saying, "I think I was named equally for Linus the Peanuts cartoon character", noting that this makes him half "Nobel-prize-winning chemist" and half "blanket-carrying cartoon character". Torvalds attended the University of Helsinki between 1988 and 1996, graduating with a master's degree in computer science from NODES research group. His academic career was interrupted after his first year of study when he joined the Finnish Army, selecting the 11-month officer training program to fulfill the mandatory military service of Finland. In the army he holds the rank of second lieutenant, with the role of a ballistic calculation officer. In 1990, he resumed his university studies, and was exposed to UNIX for the first time, in the form of a DEC MicroVAX running ULTRIX. His M.Sc. thesis was titled Linux: A Portable Operating System. His interest in computers began with a Commodore VIC-20. After the VIC-20 he purchased a Sinclair QL, which he modified extensively, especially its operating system. He programmed an assembly language and a text editor for the QL, as well as a few games. He is known to have written a Pac-Man clone named Cool Man. On January 5, 1991 he purchased an Intel 80386-based IBM PC and spent a month playing the game Prince of Persia before receiving his MINIX copy, which in turn enabled him to begin work on Linux. 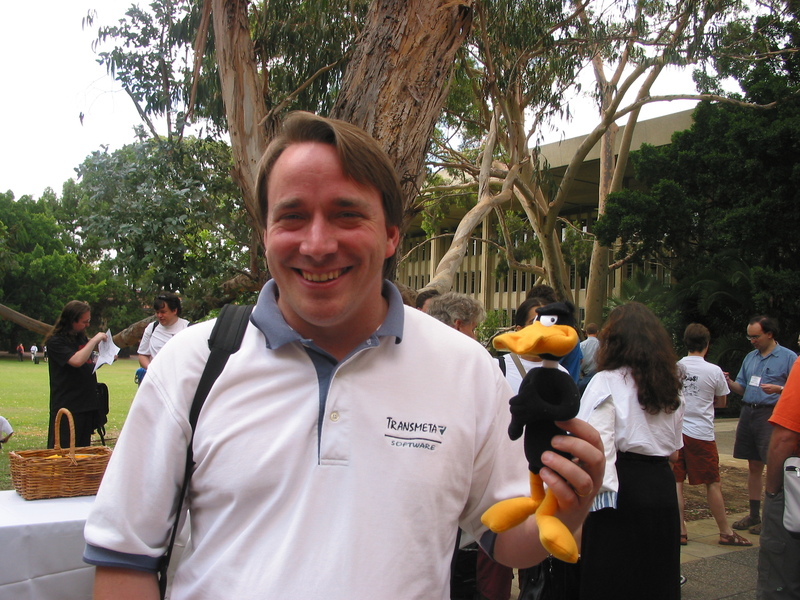 After a visit to Transmeta in late 1996, Torvalds accepted a position at the company in California, where he would work from February 1997 to June 2003. He then moved to the Open Source Development Labs, which has since merged with the Free Standards Group to become the Linux Foundation, under whose auspices he continues to work. In June 2004, Torvalds and his family moved to Portland, Oregon, to be closer to the OSDL's Beaverton, Oregon–based headquarters. From 1997 to 1999, he was involved in 86open helping to choose the standard binary format for Linux and Unix. In 1999, he was named to the MIT Technology Review TR100 as one of the top 100 innovators in the world under the age of 35. Red Hat and VA Linux, both leading developers of Linux-based software, presented Torvalds with stock options in gratitude for his creation. In 1999, both companies went public and Torvalds' share value temporarily shot up to roughly $20 million. Although Torvalds believes "open source is the only right way to do software", he also has said that he uses the "best tool for the job", even if that includes proprietary software. He was criticized for his use and alleged advocacy of the proprietary BitKeeper software for version control in the Linux kernel. However, Torvalds subsequently wrote a free-software replacement for BitKeeper called Git. Torvalds has commented on official GNOME developmental mailing lists that, in terms of desktop environments, he encourages users to switch to KDE. However, Torvalds thought KDE 4.0 was a "disaster" because of its lack of maturity, so he switched to GNOME. Dissatisfied with the loss of productivity, he switched to XFCE after the GNOME3 release, with another harsh post against GNOME. Initially Torvalds wanted to call the kernel he developed Freax (a combination of "free", "freak", and the letter X to indicate that it is a Unix-like system), but his friend Ari Lemmke, who administered the FTP server where the kernel was first hosted for downloading, named Torvalds' directory linux. As of 2006, approximately two percent of the Linux kernel was written by Torvalds himself. As thousands have contributed code to the Linux kernel, such a percentage represents one of the largest personal contributions to the overall amount of code. Torvalds remains the ultimate authority on what new code is incorporated into the standard Linux kernel. Torvalds owns the "Linux" trademark, and monitors use of it chiefly through the Linux Mark Institute. Linus Torvalds is married to Tove Torvalds (née Monni) — a six-time Finnish national karate champion — whom he first met in the autumn of 1993. Torvalds was running introductory computer laboratory exercises for students and instructed the course attendants to send him an e-mail as a test, to which Tove responded with an e-mail asking for a date. Tove and Linus were later married and have three daughters, Patricia Miranda (*5.12.1996), Daniela Yolanda (*16.4.1998), and Celeste Amanda (*20.11.2000), two of whom were born in the United States. Linux kernel's reboot system call accepts their dates of birth (written in hexadecimal) as magic values. Torvalds describes himself as "completely a-religious — atheist", adding that "I find that people seem to think religion brings morals and appreciation of nature. I actually think it detracts from both. It gives people the excuse to say, 'Oh, nature was just created,' and so the act of creation is seen to be something miraculous. I appreciate the fact that, 'Wow, it's incredible that something like this could have happened in the first place.'" He later added that while in Europe religion is mostly a personal issue, in America it has become very politicized. When discussing the issue of church and state separation, Linus also said, "Yeah, it's kind of ironic that in many European countries, there is actually a kind of legal binding between the state and the state religion." In 2010, Torvalds became a United States citizen and registered to vote in the United States; he is unaffiliated with any U.S. political party, saying, "I have way too much personal pride to want to be associated with any of them, quite frankly." In 1997, Torvalds received his Master degree (Laudatur Grade) from Department of Computer Science, University of Helsinki. Two years later he received honorary doctor status at Stockholm University, and in 2000 he received the same honor from his alma mater. In 1998 Torvalds received an EFF Pioneer Award. In 2000 he was awarded the Lovelace Medal from the British Computer Society. In 2001, he shared the Takeda Award for Social/Economic Well-Being with Richard Stallman and Ken Sakamura. In 2008, he was inducted into the Hall of Fellows of the Computer History Museum in Mountain View, California. He was awarded the C&C Prize by the NEC Corporation in 2010 for "contributions to the advancement of the information technology industry, education, research, and the improvement of our lives". InfoWorld presented him with the 2000 Award for Industry Achievement. In 2005 Torvalds appeared as one of "the best managers" in a survey by BusinessWeek. 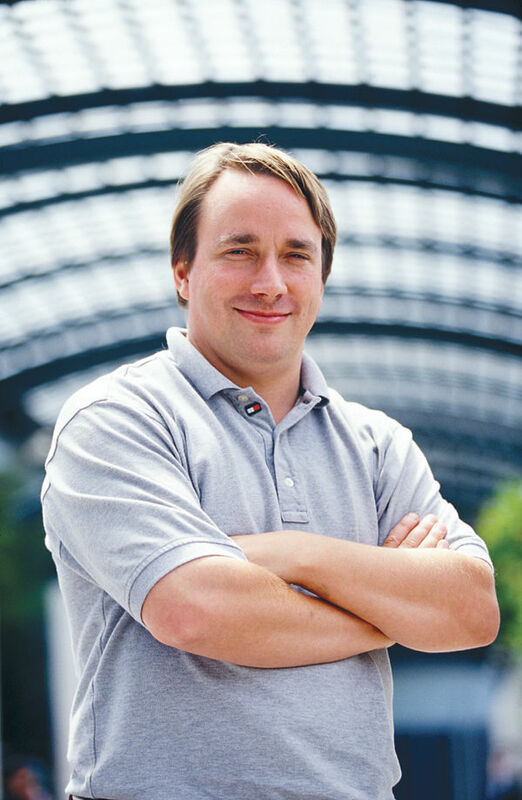 In 2006, Business 2.0 magazine named him one of "10 people who don't matter" because the growth of Linux has shrunk Torvalds' individual impact. In 1996, an asteroid (9793 Torvalds) was named after him. The 1999 novel Cryptonomicon by Neal Stephenson features several characters who use "Finux", a Unix-like operating system developed in Finland. As of March 2011, Linus has been granted 35 patents worldwide (application and granted patents).